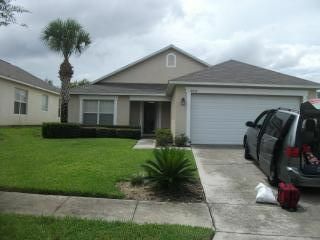 House, 3	Bedrooms, 2 Baths, 8 Sleeps,tremendous location,close to Disney World! Master bedroom has private bath room. 3 bed,pool,full kitchen, mickey mouse tv with dvd,tv with dvd in family room tv in master room,2 baths,toaster,blender.washer,dryer,frige with ice machine dishes,some towels,Pool Heat avail with addit fee.microwave,dishwasher club house walking distance,game room,pool with heat,hot tube,tiki bar,internet room small cost,exercise room,activities,kids playground,volley ball area. Home Books very fast this is an exciting place to stay,with Gated Security. The house is close to the attractions, restaurants and shopping. We enjoyed our private pool. Blizzard Beach,Tyfoon lgoon ,Aquatica water parks.